Tyson Fury ahead of his fight against Kevin "Kingpin" Johnson on Saturday. One to watch: West Ham v Chelsea could be well tasty, innit. One to Sky+: I’m gonna be at a wedding on Saturday so will tape the Munster game so I can have a clear run at the chicken dancing. One to skip: Darts. Do not get it. Cricket: Third Test, Australia v South Africa, (Sky Sports 4, 2.25am, Sat). Darts: PDC Players Championship Finals, (ITV4, 12.30pm, 6.45pm). Equestrian: Show Jumping, The Gucci Masters, (Eurosport, 9pm). Football: npower Championship, Birmingham v Middlesbrough, (Sky Sports 1, 7.30pm); Serie A, Catania v AC Milan, (Setanta Ireland, 7.40pm); Russian Premier League, Spartak Moscow v Zenit St Petersburg, (ESPN, 4.15pm). Golf: Nedbank Golf Challenge, (Sky Sports 1, 9am); PGA Tour, The World Challenge, (Sky Sports 3, 8pm). Rugby: Aviva Premiership, Sale v Northampton, (ESPN, 7.15pm); RaboDirect Pro12, Ospreys v Blues, (BBC Two Wales, 7pm; IRB Rugby Sevens, Dubai Sevens, (Sky Sports 3, 6am). 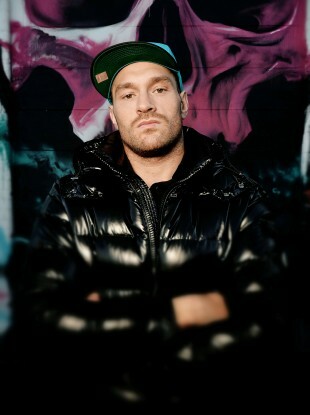 Boxing: Tyson Fury v Kevin Johnson, (Channel 5, 9pm). Cricket: Australia v South Africa, (Sky Sports 3, 2.25am, Sun). Equestrian: Show Jumping, The Gucci Masters, (Eurosport, 9.15pm). Football: Premier League, West Ham v Chelsea, (Sky Sports 2, 12.30pm); Manchester City v Everton, (Setanta, 2.30pm) Reading v Manchester United, (ESPN, 4.30pm); Premier Soccer Saturday, (RTÉ Two, 8.15pm); npower Championship, Leicester v Derby, (Sky Sports 2, 5pm); Primera Division, Barcelona v Athletic Bilbao, (Sky Sports 1, 6.55pm); Real Madrid v Atletico Madrid, (Sky Sports 1, 9pm); Serie A, Juventus v Torino, (Setanta Ireland, 7.40pm, ESPN, 7.45pm); MLS Cup Final, Los Angeles Galaxy v Houston Dynamo, (ESPN, 9.45pm). Golf: Nedbank Golf Challenge, (Sky Sports 1, 9am, Sky Sports 4 1.30pm); PGA Tour, The World Challenge, (Sky Sports 3, 6pm). Horse racing: From Newbury and Newcastle, (Channel 4, 1.55pm). Rugby: Autumn international, England v New Zealand, (Sky Sports 1, 1.30pm; Wales v Australia, (BBC1, 2pm); RaboDirect Pro12, Leinster v Zebre (RTÉ Two, 5.45pm); Munster v Glasgow, (TG4, 7.45pm); Aviva Premiership, Leicester v Bath, (ESPN, noon); IRB Rugby Sevens, Dubai Sevens, (Sky Sports 3, 6am and 1pm); Women’s International Rugby Union, England v New Zealand, (Sky Sports 1, 5pm). Snooker: UK Championship, (BBC1, 1pm and BBC2 4.30pm). Cricket: Australia v South Africa, (Sky Sports 1, 2.25am, Mon). Equestrian: Show Jumping, The Gucci Masters, (Eurosport, 2.30pm). Football: Premier League, Norwich v Sunderland, (Sky Sports 1, 3.15pm); FA Cup, Milton Keynes Dons v AFC Wimbledon, (ITV1, 12.05pm); Alfreton v Leyton Orient, (ESPN, 2.30pm; Scottish Cup, Rangers v Elgin City, (Sky Sports 1, 1pm); Hibernian v Hearts, (Sky Sports 2, 3.15pm); Primera Division, Celta Vigo v Levante, (Sky Sports 1, 6.30pm); Serie A, Napoli v Pescara, (Setanta Ireland, 11.25am), ESPN 1130; Lazio v Parma, (Setanta Ireland 1.55pm); Fiorentina v Sampdoria, (ESPN, 7.15pm; Setanta Ireland, 7.40pm); Russian Premier League, Anzhi Makhachkala v CSKA Moscow, (ESPN, 9.30am). Golf: Nedbank Golf Challenge, (Sky Sports 2, 9am); PGA Tour, The World Challenge, (Sky Sports 3, 6pm). NFL: Seattle Seahawks at Chicago Bears, Pittsburgh Steelers at Baltimore Ravens, (Sky Sports 2 from 6pm); Dallas Cowboys v Philadelphia Eagles, (Channel 4, 1am, Mon). Rugby: Aviva Premiership, Saracens v Gloucester, (Sky Sports 3, 2.30pm); RaboDirect Pro12, Scarlets v Ulster, (RTÉ Two, 3.45pm, BBC2, 3.50pm). Snooker: UK Championship, (BBC2 1.30pm, Eurosport 4pm, 8.45pm).